Maysarah Mikail, a field engineer for the Houston oilfield services company Halliburton, spent the summer in the Permian Basin, working 12-hour days in temperatures of up to 120 degrees. But it wasn’t just the searing West Texas heat that made her uncomfortable in her heavy, flame-retardant coveralls. The coveralls, designed for men, just didn’t fit right, no matter how Mikail tried to adjust, whether rolling the sleeves up to elbow or washing the coveralls repeatedly in the hope they would shrink. As she went about her job supervising a team of three engineers, she worried about loose clothing getting caught in machinery, such as oil pumps, or on handrails as she climbed ladders. Mikail doesn’t have to worry about clothing distractions anymore as Halliburton has introduced coveralls designed and made specifically for women. Working with a West Texas manufacturer and the apparel design department of Texas Tech University, Halliburton has tackled a problem that has bedeviled women since the days of Rosie the Riveter, when women flocked to factories during World War II and had to make do with ill-fitting coveralls made for men. Some 75 years later, women’s workwear is still largely men’s clothing shrunk to women’s sizes, ignoring the differences in the bodies of the two sexes, said Tyneal Buckner, chief customer officer of Halliburton’s manufacturing partner, RPS Solutions of Wolforth. As Halliburton and other companies begin to refashion coveralls for the women in their workforce, it’s part of an increasing recognition that energy companies need to do more to recruit and retain women in an industry that remains dominated by men. In the United States, women account for only about 13 percent of workers in oil exploration and production, down from about 17.5 percent a decade ago, and 14 percent in energy services, up slightly from 13 percent in 2008, according to the U.S. Labor Department. Internationally, women account for as little as 10 percent of the technical positions and jobs in the field that typically lead to roles as top executives, according to a 2017 study by the Boston Consulting Group, a management consulting firm, and World Petroleum Council, an industry group based in London. Sabrina Fang, a spokeswoman for the American Petroleum Institute, a trade group, said that diversifying the workforce has become a key priority for the industry, which has issued studies and emphasized the need to bring more women into the workforce at industry events. The industry expects women to fill at least 290,000 job openings out of a projected total of 1.9 million through 2035, and more than half of those jobs would be management and technical positions. Halliburton’s trademarked red coveralls have long been part of the company’s identity, worn with pride by the thousands of employees who work in oilfields around the world. For women, however, that pride was tempered by bulky collars, baggy sleeves and pant legs that were too long. On a visit to the Permian Basin last year, Halliburton CEO Jeff Miller learned of the coverall issues while talking with employees. Miller turned to senior human resources manager Sharla Watkins, charging her with finding a coverall more suitable for the 7,000 women who work for Halliburton at drilling and fracking sites around the world. Watkins began by putting together a focus group of about 10 women who work in oil fields, listening to their likes and dislikes, and pleas for more precise sizing. With that information, she began seeking manufacturers willing to come up with a design specifically for women — rather than just tweaking men’s coveralls — and eventually hired RPS Solutions. RPS then partnered with Texas Tech to help remake coveralls in the image of women. Shin began by using a 3-D body scanner to take detailed measurements of Halliburton’s female employees. Designing the coveralls, she explained, required a more comprehensive analysis of the wearer’s body because they use a non-stretch, flame-retardant woven fabric with less flexibility. One of the most significant alterations is an adjustable waistline resting mid-torso. It allows the wearer to cinch the waistband to her preferred fit, a feature designed by Jessica Ozoude, a recent Texas Tech graduate. The Texas Tech design did away with the traditional collar and its pointy leaves and replaced it with a rounded Mandarin collar, similar to that of a blouse. The four front pockets on the basic coveralls were raised to make it easier for women to reach, and two back pockets were added. That change was welcomed by Mikail, who uses the pockets to store gloves, two-way radios, calculators, notebooks, pens, tally books, tools, water bottles and, occasionally, pieces of equipment. As the design took shape, the manufacturer and Texas Tech hosted focus groups in Houston, Lubbock, and Brownsville, surveying approximately 150 women. All told, they came up with at least six prototypes before settling on the final design. The process took about 14 months. Women who work in the field in the United States now have the choice of receiving four coveralls available in five sizes. The employee name is stitched in script on an upper-right chest patch, as well as an American flag patch on the left arm and “Halliburton” emblazoned on the back. 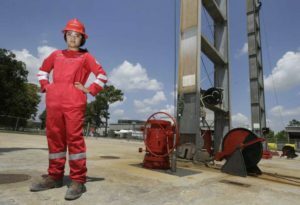 Katie Mehnert, founder and CEO of the Pink Petro advocacy group for female energy industry professionals, said Halliburton’s new coveralls show energy companies are listening to the women and taking steps to keep them as competition for workers heightens in both the industry and broader economy. Oil and gas companies are not only competing with each other but also with companies in technology, financial services and healthcare. As a result, new companies specializing in women’s workwear are springing up. SeeHerWork launched Sept. 18 in Houston to outfit tradeswomen with personal protective equipment it designs. It principally caters to construction workers, but will soon debut fire-resistant coveralls to go along with safety vests designed for women’s chest and waist proportions bras made of polyester that protect from flying debris and embers, said founder Jane Henry, a management consultant for energy companies. Jaime Glas, a former petroleum engineer for Chevron, started her own line of women’s oil field workwear last year. HauteWork’s coveralls come in three different styles designed by Glas and are available in 14 different colors. Better fitting coveralls, Glas said, not only make women safer and more comfortable, but also more confident. And that makes them more effective.